That’s really nice David. In the early morning when the comet was within M35 I took the chance and drove to the cricket pitch in Metchosin even though 90% of the sky was cloud. This is my write up of the event. Well that was fun and reconfirmed to me the value of being prepared. Around 0030hrs PDT I was putting the dogs out and looked up and saw a clear patch of sky heading to the east. I grabbed my eyepiece case, jumped in the car and headed to the cricket pitch as the 6 inch dob had already been in the car for days. It took over an hour for the clearish patches to make their way across the sky but that was OK as it gave me a chance to collimate the scope and check out various deep sky objects along the way. Eventually the left toe of Gemini (their toe) peaked through the clouds and I was able to pick out M35 with the 15X70 binos. No comet was visible so I panned about but couldn’t make out anything. Through the scope at 38X with a 31N it was a beautiful view of M35 and NGC 2158 but no comet was visible in the area. 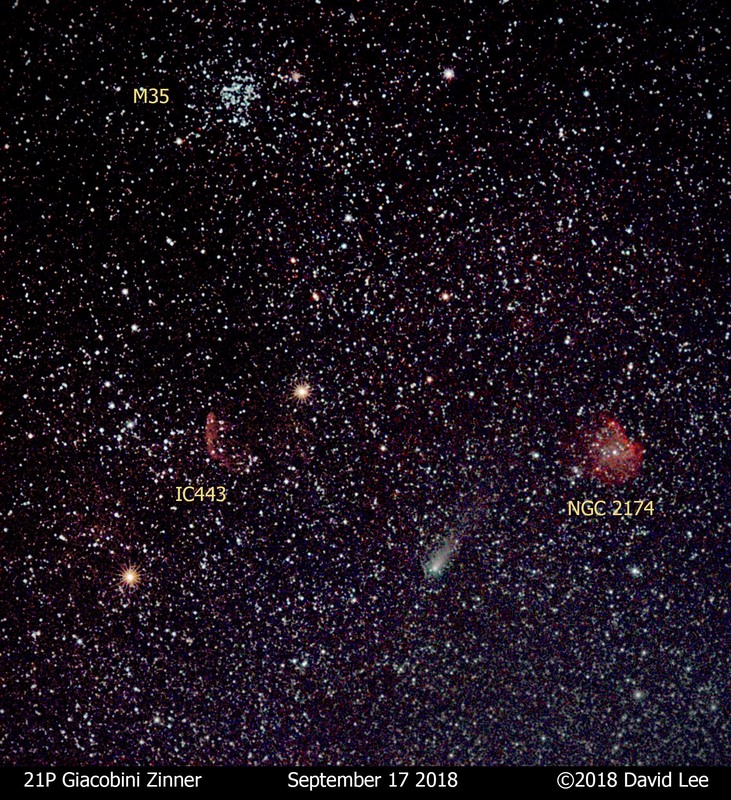 I upped the power to 60X and focused on M35 still nothing until I began to notice a fuzziness within the eastern side of the cluster to the SE(?) of a beautiful curving chain of stars. As I advanced though 120x and then finally to 200X it became apparent this was the comet fully within this beautiful cluster! 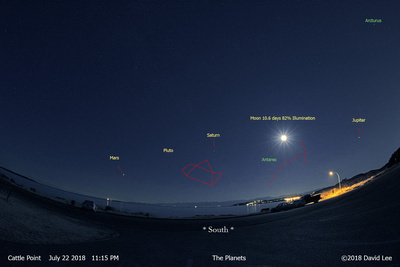 It was similar to this image except move the comet a bit down and to the left. In the end it reminded me in a way of the planetary nebula NGC 2438. Shortly after drinking in the view clouds moved in and the show was over. It wasn’t my best comet observation by far due to low altitude in the sky and being over Victoria to the south east. That was OK though because my feet were freezing as good footwear was the one thing I neglected as I raced out the door. Drove off the field at 0215 PDT and was soon tucked in bed. Many like the phrase “make hay when you can” but I prefer,”you can’t dance at the party if you don’t show up”. This means go out even if the weather doesn’t seem optimal or you won’t see things at all. On Friday July 27th 2018 Mars will make it’s closet approach to Earth in 15 years. This occurs when Mars, Earth and the Sun are aligned with Mars located on the opposite side of Earth from the Sun. Mars will slowly rise on the eastern horizon late that evening … not the best viewing situation. 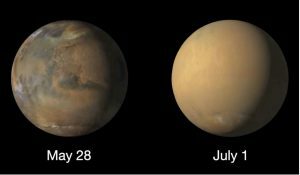 A major dust storm developed on May 31st and has obscured details of the Martian surface. (see image below) Surface details will gradually re-emerge later this Summer as the dust storm subsides. 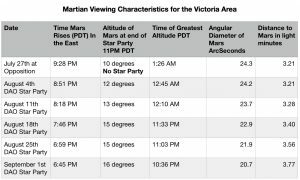 The viewing characteristics of Mars as seen from the Victoria area are tabulated below for the remaining DAO Saturday Night Summer Star Parties of the season. Notice that the appearance of Mars (angular diameter) will decrease very slowly after the opposition. One week following opposition the angular diameter will only be 0.5% smaller but Mars will rise earlier and surface features may start to re-emerge. Evening viewing conditions of Mars therefore will be more favourable and convenient in August. Consider attending a DAO Saturday Night Star Party this August. Volunteers of RASC will be there to share the night sky with their telescopes. Click here to obtain free Star Party tickets. Note: No Star Party on July 28th. In the Victoria area the best evening views of Mars are obtained with an unobstructed view of the southeast such as: Cattle Point Urban Dark Sky Park, Clover Point, Island View Beach, and Mount Tolmie. In the late evening Mars will appear fairly low in the southeast as an exceptionally bright red dot. It is hard to miss. Check it out. Click here to learn more about the Mars 2018 Opposition and observing hints. Click here to see images of the 2018 Martian Dust Storm. On a mild July 4th evening about 10 RASCals assembled at Cattle Point Urban Dark Sky Park for the Inaugural Transboundary Fireworks Festival. Attendees were rewarded with spectacular views of two July Forth Fireworks shows. Between 10 PM and 10:15 PM Friday Harbour on San Juan Island took the stage. Terrain blocked some of the low level displays but the airborne clusters filled the field of view of most scopes. The main event occurred between 10:30 PM and 10:50 PM when Fisherman Bay on Lopez Island launched their salvo. Although slightly farther away we enjoyed an unobstructed view of the Lopez conflagration. A variety of scopes were deployed including refractors, newtonian reflectors, spotting scopes, binoculars as well as an 8 inch Schmidt Cassegrain. In order to squeeze in the view RASCals resorted to lower magnifications. This confirmed that you do not need a big scope to enjoy the show. It took about one minute 20 seconds for the muffled booms to arrive on the scene. This soundscape combined by the spontaneous whoops and ah’s from the RASCals added to the party atmosphere. It would have been nice if we were able to transition from the fireworks to star gazing … but clouds intervened. Should we try again next year? Randy Atwood’s attached photo captured Chris Aesoph giving it two thumbs up! So I reckon that is a yes. It was a RASCal Worthy event. The attention the photons received was well deserved. Thanks to all the attendees. On Wednesday, January 31st, weather willing, we will be able to view a total eclipse of the Moon. The Moon will move into full eclipse in the early hours of the morning and will be in partial phase in the western sky as the Sun rises. The Total Lunar Eclipse will develop over the course of about 3 hours. It’s a perfect opportunity to capture some snapshots of the event. Read further to find out what happens during the eclipse and how to capture it photographically. A total lunar eclipse occurs when the Earth comes between the Sun and the Moon. During a lunar eclipse the Moon’s position traverses the Earth’s shadow. The Moon’s first contact with the Earth’s shadow is at the outer band of the shadow called the penumbra. The light falling on the Moon is progressively blocked until at the moment of total eclipse the Moon is completely in the darkest central area of the Earth’s shadow called the umbra. At the point of total eclipse the process starts to reverse itself until the Moon is totally out of the Earth’s shadow. Above Eclipse times are for Pacific Standard Time (PST) for the west coast of North America, and are calculated from UT as presented in the Observers Handbook 2018, pages 126-27. Everything from your eyes, binoculars and telescope are suitable. Bear in mind this is a long process and at this time of year dress warmly and bring a chair if you want to be comfortable. Find yourself a location that has a clear horizon view of the west especially if you wish to view during the late stages. Keep a log of what you see and note the time. Pay attention to how much of the light on the moon is obscured and if there are any colouration changes. 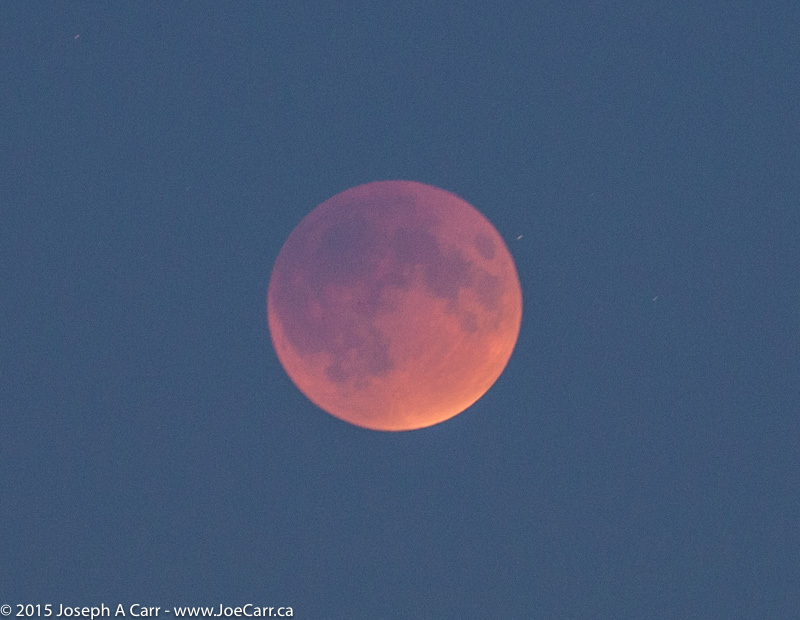 During the total eclipse the Moon will take on a deep orange-red colour. The colour of the Moon is a function of contaminants in the atmosphere and varies from year to year. Any camera with the capability of setting shutter speeds and aperture settings manually will do fine. The ability to use interchangeable lenses will be an advantage for more detailed images of the Moon. For the darker parts of the eclipse, eg. totality you should use a tripod support for best results. If you have access to a telescope you can try capturing the event using prime focus techniques through the telescope optics. Today’s digital cameras are very sensitive to light reflected by the Moon. Use ISO 400 to ISO 800 and a long telephoto lens or zoom setting. Smartphones and point-and-shoot digital cameras will not produce rewarding photos of the eclipsed Moon, but can be useful for taking panoramic shots of your surroundings which include the eclipsed Moon. The simplest eclipse pictures can be taken with manual settings on your camera and a normal lens, preferably supported by a tripod. For best results use a cable release to minimize vibration. Images taken in this fashion result in a small lunar image. This is why it is preferable to use a telephoto lens to photograph the Moon. For a 35mm camera try a 200mm lens or something close to this, even better a 500mm lens or higher. You may also use teleconvertors to increase magnification, these typically come in 1.4x and 2x strengths. Their downside is they reduce the effective aperture of your optical system. A 1.4x teleconvertor will decrease your effective exposure by 1 stop, a 2x teleconvertor will decrease your effective exposure by 2 stops. Work out your effective aperture of your optical system ahead of time so you don’t have to think about it on the night of the eclipse. To achieve any higher magnification than what is stated above you will have to use a telescope at prime focus. For this your manual camera does need to have the capability of using interchangeable lenses. For prime focus you will use the telescope optics as your interchangeable lens. To attach your camera to your telescope you will need two things a T-adapter that fits your camera and a telescope camera adapter that fits your telescope. The telescope camera adapter is designed to fit in the focusing tube of your telescope and is threaded to accept the T-adapter of your camera. 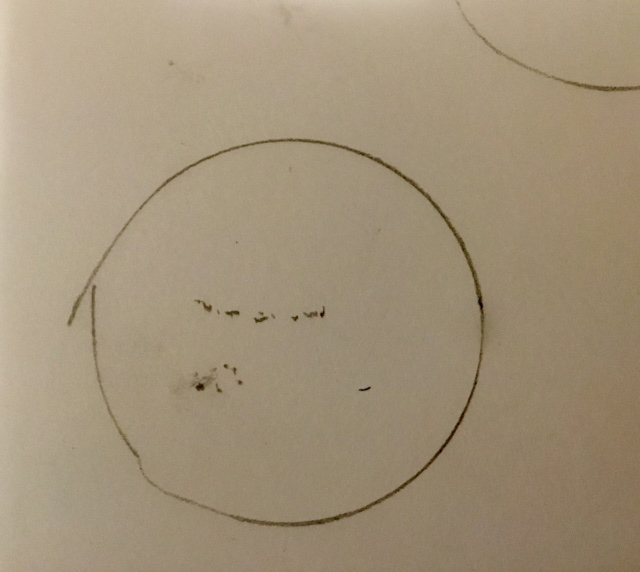 With the magnification involved with telescopic optics it is likely that you will need to use a tracking mount. Preferably the mount should be able to track at lunar speed as opposed to sidereal but if the shutter speeds chosen are shorter than 1 or 2 minutes this is not critical. Exposure times are the next consideration. The following exposure times are based on a medium speed film and an effective aperture that would be common with a long telephoto and teleconverter combination. Exposures may vary with your equipment based on ISO speed of film used and effective aperture. The Danjon Lunar Eclipse Luminosity Scale has been included to provide better guesstimates for totality. 1st Contact 1/125 second at f/16 see note 1. 2nd Contact 2 seconds at f/16 see note 2. 3rd Contact 2 seconds at f/16 see note 2. 4th Contact 1/125 second at f/16 see note 1. Note 1. 1st and 4th contact times given for the partial phases are biased for the light part of the Moon. Remember you are dealing with vastly different exposures between the light and dark parts of the Moon during eclipse. The bias of about 1 stop minus avoids overexposure of the dominant bright area of the Moon. Note 2. 2nd and 3rd contact times given for the partial phases are biased for the dark part of the Moon. The bias of about 1 stop plus is a good strategy for negative film not quite so good for slides and digital capture given they don’t tolerate overexposure well. The exposure times are only recommendations. Remember the cardinal rule about photography … bracket. Always try exposures plus and minus your chosen exposure. This gives you a better chance at getting usable results. Let’s all hope for clear weather. If you have any questions please send email to David Lee at davidflee7331@gmail.com.